Culinary Class Act: Mexican Kitchen Street tacos, homemade salsa and Mexican tostadas with a side of memories from Tonalà, please! The Mexican Kitchen at the Hamilton Farmers’ Market recently underwent a major shift in flavor. While you may know the vendor for their homemade chocolate creations, the new owners are cooking up more savory classic Mexican dishes in the kitchen. While Mexican cuisine is no stranger to Hamilton’s downtown restaurant scene, the tacos, quesadillas, corn tamales and pozole coming out of this tiny kitchen are worth paying a little extra attention to. 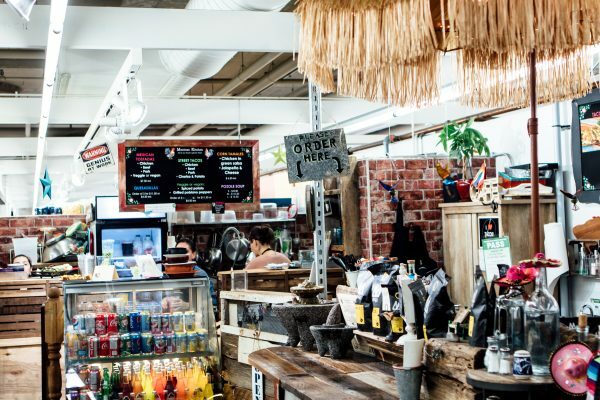 Housed in what has become my favourite spot in Hamilton over the years, the Mexican Kitchen is not only serving up fresh dishes at an affordable price but adds a little Mexican hospitality to the market’s tight knit community feel. From the hanging glass hummingbirds on the tiki umbrella to the colourful handmade cups from the Tonalà Craft Market near Guadalajara, every single embellishment is a conversation starter to learn more about the owners’ stories and memories from Mexico. 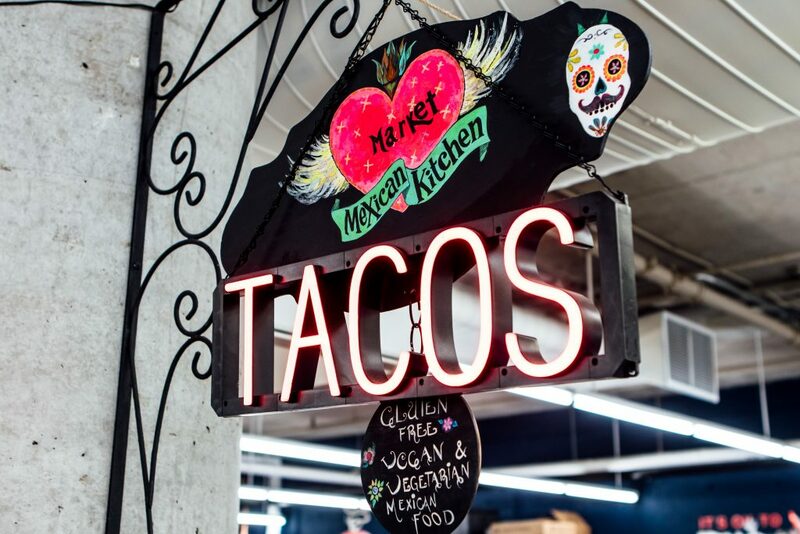 At the Mexican Kitchen you’ll find great food at arguably the cutest vendor at the Hamilton Farmers’ Market, while also learning something new. It definitely hits all the sweet (or shall I say spicy) spots for me. There’s a couple ways you can get yourself downtown. Either take the 5, 51 or 1 Hamilton Street Railway bus from Sterling Street and University Avenue heading east, or take the 5 or 10 heading east from Main Street West and Emerson Street. Hop off at Main Street West and MacNab Street South. You can cut through the MacNab Transit Terminal towards Jackson Square and make your way inside to the Hamilton Farmers’ Market mall entrance. If you prefer a slightly longer walk outdoors you can head west on Main Street West and turn right onto Summers Lane until you reach York Boulevard. Turn right on York Boulevard and the main entrance will be on your right. The Mexican Kitchen is located on the lower level opposite from Slurp Ramen and Leslie’s European Deli. At the Mexican Kitchen you can easily get away with spending under $10 for a filling meal, but it is cash only. Delicious soft corn tortilla tacos or quesadillas go for $4.50 each or you can order three of the same kind for $11.50. Each taco or quesadilla comes with a side of home-made red or green salsa. Four different kinds of Mexican tostadas are $7.50 each while corn tamales go for $6.50. A small warm traditional pozole soup is $8.50, while medium and large go for $10.50 and $12.50, respectively. The simple menu also has a few tasteful extras, you can add fresh squeezed lemonade to your order for $1.00, a churro for $2.00, some extra avocado, cheese, sour cream and beans for $0.75 and salsa or meat for $0.95. If you’re dining solo or simply not up for up for sharing, I recommend the pozole soup with chicken topped with lettuce, radish, tortilla chips and lime. You can add fresh avocados or meat as an extra to the dish. Complete your meal with a glass of fresh lemonade and treat yourself to a churro for dessert. If you’re like me and like to convince friends to tag along so you can try as much things as possible without breaking the bank then I’m proud to share with you my Mexican Kitchen game plan for three. Start off with tacos, I recommend the spiced potatoes or grilled poblano peppers with onion and zucchini, sprinkled with roasted garlic, lettuce, pickled red onions and cilantro. Share a tostada, which is basically the flat version of a taco topped with a mountainous pile of fresh ingredients. All tostadas come with a bed of homemade beans on a crunchy grilled tortilla and the option of sour cream and cheese. Your choice of filling includes slow cooked meat (chicken, beef, pork or chorizo and potato), veggie (avocado, sour cream and cheese), vegan (extra avocado), or cauliflower ceviche (cauliflower with onion, parsley, cucumber, avocado topped with spices and lime juice). Don’t forget the lemonade and churros, and your meal will still be under $10.00 each! 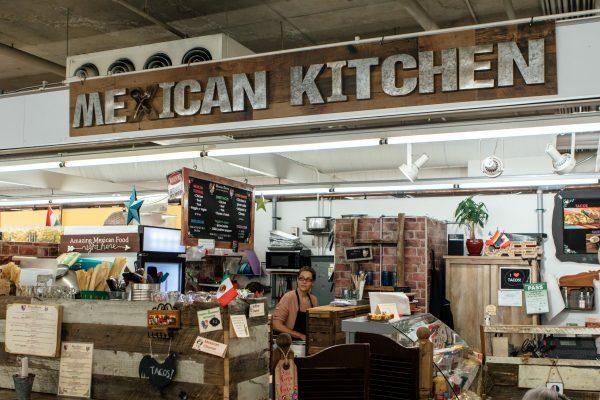 While the menu at the Mexican Kitchen consists of five main dishes, each one is made from scratch, is gluten-free and can be customizable for meat, vegetarian and vegan diets. You can also add an extra helping of their fresh ingredients and handmade beans and salsas for an incredibly affordable price, where else can you get extra avocado for less than a dollar? The corner vendor has also utilized their space to maximize seating. There are bar stools spanning the entire length of the counter lining the vendor and several tables that seat four. At the Mexican Kitchen there’s something for everybody and when doubt you can never go wrong with a taco.